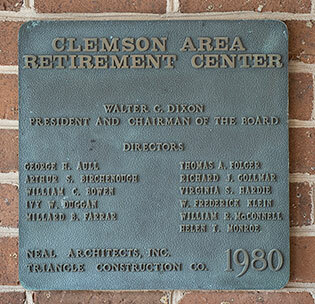 Clemson Downs (Clemson Area Retirement Center) is owned and operated by CARC, Inc., a corporation registered with the South Carolina Secretary of State over 40 years ago by Mr. Walter C. Dixon. The CARC, Inc. Board of Directors, elected by the stockholders of the corporation, are responsible for managing the financial affairs of the corporation and for the oversight of all matters in regard to the fulfilling of service obligations to occupants. 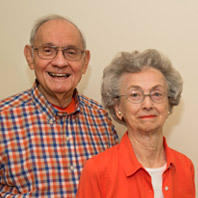 Clemson Downs is privately owned by the stockholders and has a long-standing tradition of excellence in the community as well as the continuing care retirement community industry. Apartments that allow you to live, create, and decorate your own space, as well as living in a communal, welcoming and supportive environment. Features a well maintained and pastoral campus with many seasonal plantings as well as native flowers and trees. Spacious living with well lighted hallways, all apartments have interior entry ways for your independent lifestyle and safety. Residents also have their own outdoor space to garden or entertain. There is also a community garden for all residents. Quality, continuum care for every stage of your life. Clemson Downs is proud to be neighbors with Clemson University, where opportunities abound for intellectual growth, including a performing arts center, continuing education, collegiate sporting events, and much more. An on-site wellness center focuses on all seven (7) elements of well-being: physical, emotional, spiritual, intellectual, vocational, social, and environmental.